(a.k.a. Mike Arnold) on April 9, 2001. 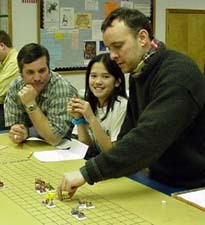 Kudos to Kaarin for GMing Circus Maximus on Saturday (April 7, 2001). Our initial entrants of 5 quickly swelled to a solid dozen entrants just prior to the drop of the hanky. Our grand Charioteers were a slendid mix of veterans, novices and youth. This included a great mix of Heavy, Medium and Light chariots, too. Lap Two: Yikes! The carnage began...as the Red Vixen (Kaarin Engelmann) tried to ram her first place Purple Majesty hubby (Karsten Engelmann) into the inside wall, she flipped, and started a chain reaction of about 3-4 other chariots (I lost count). As the dust cleared, about 4-5 teams of horses (minus chariots) exited the turn. (One was, I think, the Golden Chariot run by Zane Linder. )Young William Webb, the Green Goon, succesfully cut free, jumped over the wall and lived, but the fate of the others was the usual Death by Tramplation. The Yellow Coward (Charles Severance), a shifty veteran, who exacted fear and torture on the youthful charioteers (killing the White Maiden--Michelle Arnold--and harrasing Green Goon), met his worthwhile demise at the hands of the Grey Ghost (Mike Arnold), revenging his daughter's untimely and ruthless death (picking on children--the Coward's name fits). Actually, Grey Ghost made the Yellow Coward flip. The yellow chariot spun wildly over the head of the Brown Brownie (Dano-o Semsel), who--in turn--performed a successful chariot attack against the hapless Yellow Coward running down the track. Lap Three: Purple Majesty cruised to an easy victory with slight noises from Orange Crush (Jim Phillips) coming second (a novice--bravo!) and Blue Daddy (Flint Webb, father of the Green Goon) bringing in 3rd, nipping at his Majesty's heels for a brief moment. The battered and hobbled Brown Brownie and Grey Ghost (minus a horse) were delicately jokeying to finish when Brownie's wheel finally had had enough and flew off, so he finished behind the Grey Ghost, Brownie bravely clinging to the reins of his team and with a couple of driver damage points remaining. (He's recovering nicely at Alexandria Hospital.) An additional "atta boy" to the Black Demon (Paul Meyers) who ran 2/3rds of the race (and finished) with only TWO horses! Last updated by kae on April 9, 2001.